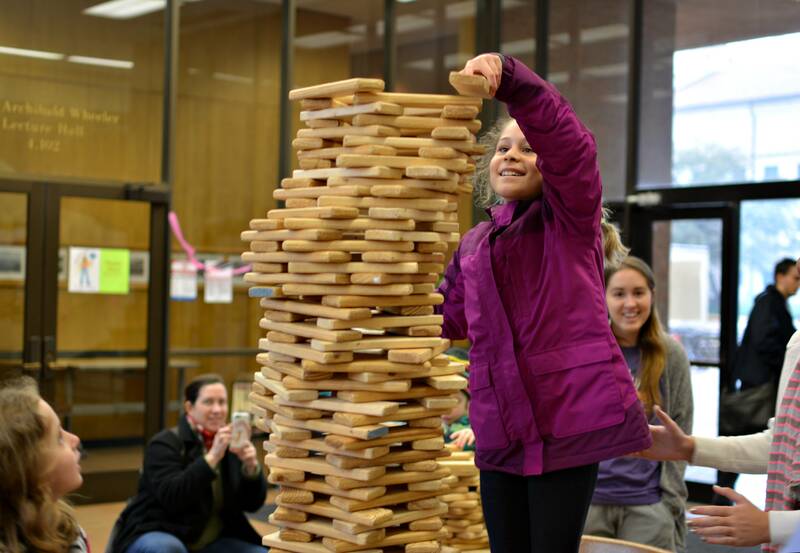 A troop of fifth-grade Girl Scouts builds a roller coaster at Introduce a Girl to Engineering Day in the ETC building Saturday afternoon. 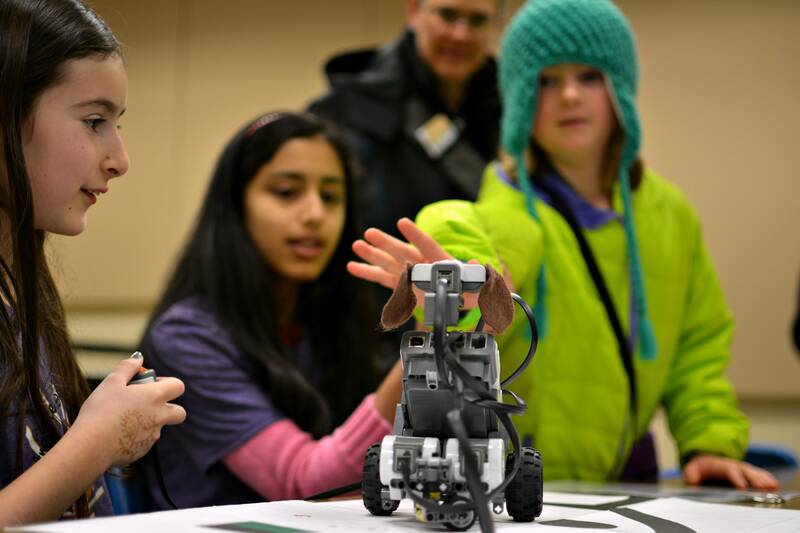 The event draws thousands of girls to UT’s campus for hands-on engineering activities. 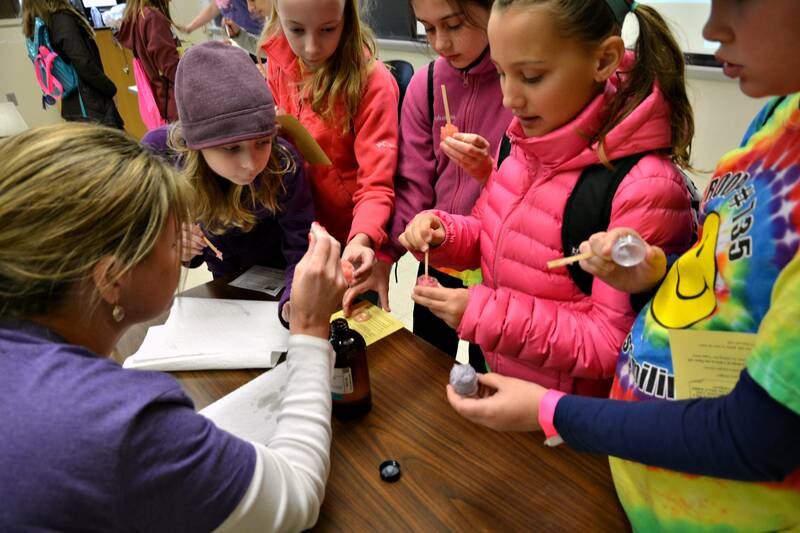 While middle school girls built “butterfly bots” with toothbrush heads and miniature motors, fourth- and fifth-grade students created balloon-powered toy cars and raced their creations at Introduce a Girl to Engineering Day on Saturday. UT engineering students worked with local elementary and middle school girls to create science-oriented projects and to introduce young women to the STEM fields — science, technology, engineering and mathematics. Tricia Berry, director of the Women in Engineering Program, said over 2,000 students in first through eighth grade were invited to campus to participate in the event. “[Our goal is] to excite girls about science, technology, engineering and math to give them a day to not only explore through hands-on activities but to also see a whole bunch of role models who they can visit with and learn from and hopefully aspire to be like,” Berry said. According to Berry, about 600 UT students volunteered for the event, facilitating over 100 distinct activities. For example, aerospace engineering students helped fourth- and fifth-graders create balloon-powered cars. Berry said the goal of the day was to keep young women interested in STEM fields. “We know that especially in the elementary and middle school ages, that that’s when girls tend to get turned off from math and science, and so anything we can do to get them excited is a positive thing,” Berry said. Electrical engineering sophomore Chamali Raigama said she wishes she had been more exposed to engineering concepts when she was younger. Raigama said she didn’t know what engineers did until she came to college. Mary Cole, software engineer at Halliburton-owned Landmark Graphics, said engineering requires students to be creative when approaching a problem in actuality.